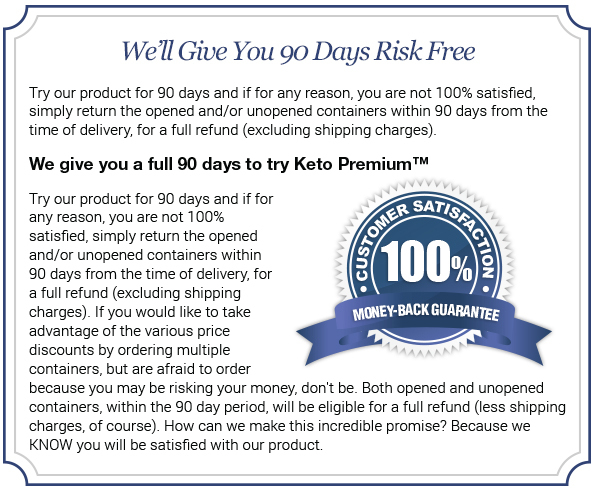 We're so confident that Keto Premium™ will work for you that we are offering a 90 day Money Back Guarantee! So, feel confident that it will work for you*, or your money back! "Not	All Keto Supplements Are Created Equal." Before you buy a Ketogenic supplement, it's important to know what you're buying. Fly-by-night supplement makers are rushing to create their own products and "cash-in" on the new phenomenon of taking Keto health supplements for optimizing weight loss whilst on a Ketogenic diet. So, it is imperative to take your time and read the label carefully. Beware, many of the Keto supplements don't have a high enough concentration of Beta Hydroxybutyrate (BHB) ketones to be effective or use poor quality synthetic versions of the four main exogenous salts. And more importantly, most supplements do not use the proper dose of BHB ketones found beneficial in clinical studies. Effective results with Keto supplements are mainly dependent on the quality of the exogenous ketones you buy*. So, before you purchase anything, make sure the Ketogenic supplement you choose is formulated to undeniably boost and maintain ketosis. Why Is The Ketogenic Diet The Hottest Diet Today? The Ketogenic Diet became popular when the most famous doctor on TV discussed the benefits of Ketogenic supplements for boosting ketosis to 'lose weight' on his popular show. Now, Ketogenic supplements are the new leaders for achieving and maintaining dramatic, fat burning, weight loss. It's important to note that 100% pure, natural ketones derived from Beta Hydroxybutyrate (BHB) were used in the studies (exactly as found in Keto Premium™), not a synthetic substitute. 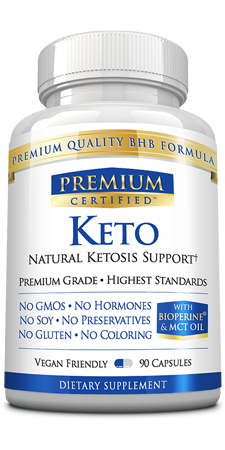 Keto Premium™ also contains MCT (Medium-chain triglycerides) oil and BioPerine® (Piperine), which clinical studies show are essential for reaching ketosis and the optimum absorption of exogenous ketones (respectively). *Results of this study may not be an implication of future results. Always consult your physician before making any dietary changes or starting any nutritional and lifestyle changes. Don't Get Fooled When Buying Keto Supplements! There is a lot to watch out for when buying Ketogenic supplements. For your convenience, we have summarized the most important factors to consider. You can see what the recommendations are and where our product stands compared to others on the market. The world's most famous TV doctor gives very specific criteria on what to look for. Second, make sure the formula provides an effective 2,000 mg daily dose of Beta Hydroxybutyrate (BHB) derived ketones, and does not contain any unnecessary proprietary blends, preservatives, additives, binders or fillers. It must contain 2,000 mg of quality Beta Hydroxybutyrate (BHB) derived ketones. It should contain 4 essential ketone salts (calcium, magnesium, sodium and potassium) to boost ketosis for effective fat burning. It should contain MCT (Medium-chain triglycerides) oil for enhancing ketone body production and stabilizing bllod sugar. It should contain BioPerine® for optimum absorption and fast results. It must be packaged in a vegetarian capsule for quicker absorption and easier digestion. So, check the label and make sure it meets all of these criteria. If it doesn't, don't buy it! Look out for proprietary blends as you don't know how much of the active ingredients you are getting. Be aware of false claims and unsupported facts. YES, Keto Premium™ meets all of the above criteria: It contains a daily serving of 2,000 mg of Beta Hydroxybutyrate (BHB) derived exogenous ketones, it contains 4 different types of essential ketone salts (calcium, magnesium, sodium and potassium) and MCT oil for boosting ketosis and hunger suppression. Plus, it also contains Bioperine® for enhanced bioavailability. It does not contain any proprietary blends, fillers, preservatives, binders or any additives. It is 100% pure and natural, and packaged in a vegetarian capsule. It comes with a superb 90-day money back guarantee. It is manufactured in an FDA registered and cGMP certified lab, which complies with US Pharmacopeia's quality standards. Keto Premium compared to the leading brands in the industry. Keto Premium was created to meet the growing demands of consumers for a high quality, premium Keto supplement at the best price possible. We developed Keto Premium with the highest quality and concentration of BHB derived ketones you need to boost ketosis. At Keto Premium, we never use false claims or misrepresent the facts. We tell you about what's out there, what's working and why. We only quote from real clinical studies. And we will never put you on an auto-ship program. We don't believe in them. You will be billed one time and that's it. What Sets Keto Premium Apart From Other Products? Keto Premium contains a high concentration, 2,000 mg, of Beta Hydroxybutyrate (BHB) derived ketones. Keto Premium contains 4 essential ketone salts which boost ketosis for effective fat burning. Keto Premium contains MCT oil for boosting ketosis and hunger suppression. Keto Premium contains BioPerine® for optimal absorption and increased benefits. Keto Premium is doctor-formulated and recommended. (All ingredients were selected based on clinical data and scientific studies). Keto Premium has no preservatives, additives, fillers or binders. It also does not contain unnecessary proprietary blends. Keto Premium contains only 100% pure natural ingredients and is packaged in a vegetarian capsule. Keto Premium is manufactured in an FDA registered lab that is cGMP certified. And it complies with the US Pharmacopeia's standards for quality and purity. Join the 1,000's of satisfied customers who have experienced great results using Keto Premium! All You Need To Know About Ketogenic Supplements? OK, first things first - it's important to understand that not all Ketogenic supplements are created equal. Only a high quality Keto supplement is going to get you the results you are looking for. Beta-Hydroxybutyrate (BHB) is a substance which your body manufactures when you enter natural ketosis. In ketosis, your body switches from glycolysis (breaking down carbs) to lipolysis (breaking down fats). Formulating 4 types of BHB ketones, just like the BHB ketones found in your body, along with salts (such as potassium, calcium, sodium and magnesium) and added substances like Medium-chain triglyceride (MCT) oil and Bioperine®, can powerfully kick-start your body into a state of ketosis. Ketosis is naturally reached after eating a Ketogenic (a high-fat) diet, starvation or vigorous exercise. In ketosis, instead of breaking down glucose or glycogen for energy, your body burns stored fat, which causes Beta-Hydroxybutyrate (BHB) ketones to be released into your bloodstream. Checking your blood for ketones is ones way to ensure that you have achieved ketosis. People have difficulties starting a strict Ketogenic diet, due to severe symptoms known as "Keto-Flu". People would rather give up on significant weight loss rather than suffer through keto flu symptoms. 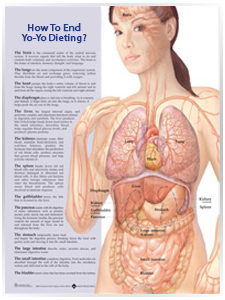 In addition, maintaining this type of diet is increasingly challenging over a long period of time. Taking exogenous ketones (i.e. ketones made outside of the body) derived from pure Beta-Hydroxybutyrate (BHB), will mimic the endogenous ketones (i.e. ketones made inside the body) and therefore plunge your body into ketosis. As a result, starting and maintaining a Ketogenic diet is effortless. 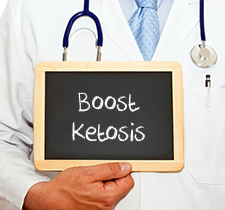 In addition to dramatic weight loss, there are many clinical studies which suggest the positive effects that reaching ketosis has on the body. Ketosis burns stored fat efficiently for energy, stabilizes blood sugar, improves cognitive function, regenerates the nervous system and suppresses appetite. 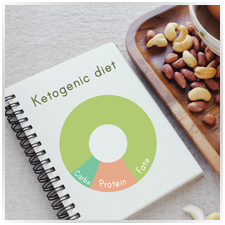 What Are The Key Elements Of Keto Premium™? 2,000 mg of 100% pure, natural Beta-Hydroxybutyrate (BHB) ketones, combined with Medium-Chain Triglyceride (MCT) oil for an added ketosis boost and hunger suppression aid, PLUS, Bioperine® for increased bioavailability, are the keys to optimal health and are found in abundance inside a premium Ketogenic supplement like Keto Premium™. Ketogenic Supplements Help Our Bodies And Brains! Beta-Hydroxybutyrate (BHB) is one of the main ketones vital to your body in order to reach a state of ketosis, which causes it to burn stored fat. Our bodies have adapted to hold on to fat in case of famine. As a result, it's quite difficult to get rid of stored fat. Studies have found remarkable improvement in cognitive function from a Ketogenic diet and being researched as potential treatments for degenerative illnesses. Ketosis also regulates blood sugar, suppresses appetite and efficiently provides energy to cells. In ketosis, your body will continue to break down carbohydrates, however, it will do so even more efficiently. Ketosis should not be confused with ketoacidosis, which is an extremely dangerous complication that can occur in people with Type 1 or Type 2 diabetes. If you are a diabetic, it is important that you consult with your doctor before starting any diet. When you take a Ketogenic supplement, you are helping your body's natural process to achieve ketosis and speed up fat burning as well as improving your physical and mental health in many other ways at the same time. What's The Science Behind Keto Supplements? And Do They Really Work? Natural Keto supplements are generally safe to take and are being favored more and more in addition to or in place of a Ketogenic diet, which can often leave nasty side effects in its tracks. Specific BHB ketones have been identified as being significant for ensuring that a quality Ketogenic product will deliver effective benefits for boosting ketosis. The problem is when manufacturers don't pay attention to the research and produce ineffective formulas that simply will not get the results you are looking for. Always check the label and look for 4 different types of BHB ketones such as potassium, sodium and calcium that are backed by clinical studies and research. Synthetically grown ingredients in a lab and low potencies in a product will essentially make a Keto supplement ineffective. Significant clinical studies of Beta-Hydroxybutyrate (BHB) ketones have been published in journals such as the Frontiers in Physiology, Obesity and Canadian Family Physician, where scientists used standardized Beta-Hydroxybutyrate (BHB) to study its numerous health benefits. The studies document the positive effects BHB has on fat burning weight loss, cognitive function and neurodegenerative diseases, and increased energy production. Details can be found on our clinical study page. A premium Ketogenic supplement works to boost your body into ketosis. The benefits include burning stored fat cells, regulating blood sugar, improving stamina during workouts, increasing cognitive function, as well as, acting as a powerful antioxidant. Clinical Study: Do Ketogenic Supplements Really Work? After being mentioned on TV, the sales of Keto supplements have gone through the roof. This is in part due to the explanation of the Ketogenic diet that was mentioned on the famous TV show. To be clear, America's favorite doctor does not endorse any specific Ketogenic supplement, but he does give specific guidelines as to what to look for. Ketogenic supplements have been all over the media recently. As a result, many studies have been carried out and published in a range of journals touting the benefits of exogenous ketones, which cause the liver to break down stubborn fat in the body. One of the most prominent clinical studies, published in Frontiers in Physiology, evaluated the benefits of ketosis for human health. Specifically, it showed that ketosis may be safely achieved using exogenous ketones to speed up the body's natural process to burn fat. Studies have also shown MCT (Medium-Chain Triglyceride) oil to be effective for weight loss as they are easily broken down by the liver which results in more energy being burnt. Keto supplements can be used alongside the Ketogenic diet or as a stand alone. Taking supplements containing clinically proven exogenous ketones such as Beta-Hydroxybutyrate (BHB) derived ketone salts and MCT oil, may help promote weight loss and improve the symptoms of the "Keto-Flu", an unwanted side effect of the Keto diet. The cross-over study (three studies in one) evaluated the antihypertensive effectiveness of Beta-Hydroxybutyrate (BHB), on healthy volunteers. In total, three randomized metabolic studies were conducted with a total of 45 participants, 28 men and 17 women in order to gauge the health benefits of ketosis. Researchers conducted the three studies testing out the effects of different concentrations of exogenous BHB. Blood concentration of BHB was then tested several times within a 24 hour period. At the end of the trial, the researchers concluded that Beta-Hydroxybutyrate (BHB) significantly lowered sugar and fat levels in the blood. BHB may be safely offered to overweight, non-diabetic patients as an alternative treatment to the secondary effects of the Ketogenic diet or as a safe option for weight and fat loss. In summary, Ketogenic supplements, that contain clinically proven BHB derived ketone salts, are extremely effective in boosting ketosis and thus causing the body to burn stubborn fat cells. To be clear, this study specifically used 100% pure BHB, the same quality BHB in Keto Premium™. So, if you're going to buy a Ketogenic supplement, make sure it says 100% pure on the label! Medium-chain triglycerides (MCTs) are a type of fatty acid that have 6-10 carbons. Research has found that they are easily broken down by the liver for fuel and that they increase feelings of satiety especially when compared to long-chain fatty acids. One study illustrated that MCTs are effective for weight loss and weight management. The study was conducted on 49 overweight individuals between the ages of 19-50 for a period of 16 weeks. The subjects were either given MCT oil or olive oil along with weekly weight loss counselling. Weight and waist circumference measurements were taken weekly. At the end of the study, results showed that those who had consumed MCT oil had a greater weight loss compared to the olive oil group. Total fat mass and abdominal adipose tissue were also lower with the consumption of MCT oil. Bioperine® (Piperine) has been shown to improve the absorption of ketone salts derived from BHB. Published in journals such as Planta Medica® studies examined the effects of Bioperine® on the ability to absorb effective key nutrients present in quality Keto supplements. Black pepper (Piper nigrum), contains the active ingredient Piperine, which, in highly concentrated doses, helps the absorption of vitamins, minerals and nutrients into the bloodstream. This patented, clinically proven highly concentrated ingredient, known as Bioperine®, is the key to enhancing the many incredible benefits of BHB. Why Is Keto Premium The #1 Choice? Keto Premium contains a high concentration, 2,000 mg, of Beta-Hydroxybutyrate (BHB) derived ketone salts. Keto Premium contains 4 essential ketone salts to boost ketosis for effective fat burning. Keto Premium contains calcium, magnesium, sodium and potassium to replenish lost electrolytes. Keto Premium contains MCT oil to further boost ketosis and increase satiety. Keto Premium is doctor-formulated and recommended. Keto Premium has no additives, fillers, binders or preservatives. Keto Premium is packaged in a vegan capsule..
And complies with the US Pharmacopeia's standards for quality and purity. *Results contained within may not be an implication of future results. Always consult your physician before making any dietary or lifestyle changes. We're proud of Keto Premium and believe it is the most effective Keto supplement available. And we are so happy that so many of our customers agree with us! So, if you have experienced great results with Keto Premium, tell us about it! We would love to hear from you! If you would like to leave a message or ask a question that is not answered below, feel free to ask. We're here to help you! Just click here to go to customer support. 1. Why choose Keto Premium? Keto Premium is the premium brand for high quality supplement in order to boost and sustain ketosis. We keep everything transparent and don't hide behind our label or our website. Plain and simple, we provide the best Keto supplement at the best price. We never use false claims and will never bill your credit card for anything you didn't order - no auto-shipping! Keto Premium was formulated to have the recommended concentration of BHB derived ketone salts and go above and beyond them to make sure you get the absolute best Keto product. Keto Premium	contains 4 essential ketone salts to boost ketosis for effective fat burning. Keto Premium 90 capsules per bottle (a full month's supply). Keto Premium has only 100% pure clinically proven and natural key ingredients . Keto Premium has no additives, fillers or binders. Keto Premium comes packaged in a vegetarian capsule. Studies have found MCTs to speed up the metabolism as it is easily broken down by the liver. It also increases levels of ketones in the bloodstream, thus further boosting the process of ketosis and increasing feelings of satiety. Research has documented the positive effects of BioPerine® upon increasing the absorption of Beta-Hydroxybutyrate (BHB) and MCT oil into the body, ensuring full benefits for optimal results, faster. The recommended dose is three capsules daily. Each bottle of Keto Premium contains 90 capsules, which equates to a month's supply. 5. Can I see the label of Keto Premium? 6. What are all the ingredients inside each capsule? Keto Premium contains the purest grade Beta-Hydroxybutyrate (BHB) derived ketone salts (Sodium, Potassium, Calcium and Magnesium) in the correct quantities, as indicated in clinical studies. In fact, it provides a significant higher daily serving for the very best results. Keto Premium also contains MCT oil to further boost ketosis by increasing levels of ketones in the bloodstream. MCT oil also keeps you feeling fuller for longer so you eat less throughout the day. The inclusion of BioPerine® (Piperine) ensures optimal absorption and increased benefits. It does not contain an unnecessary proprietary blend that can weaken the effectiveness of the active ingredients. Keto Premium has no added fillers, binders or additives and meets the strength and purity standards set forth by the USP/NF (United States Pharmacopeia–National Formulary). Each ingredient was carefully researched and selected based on clinical data. Details can be found on our clinical study page. Keto Premium ranks among the highest in terms of quality and purity of ingredients and effectiveness on the market. 7. Are there any side effects associated with taking Keto Premium? There are no noted side effects when taking this product but we always recommend contacting your physician. Keto Premium is manufactured in a cGMP certified laboratory in the USA. The ingredients are 100% pure, all natural with no additives, preservatives, or artificial ingredients. If you have an existing thyroid problem or any other known medical condition, pregnant or nursing, and you are under the age of 18, please also contact your physician before taking this product. It is also important to note that you should ensure not to exceed the recommended daily dose as set forth by the manufacturer. 8. Will Keto Premium really help me lose weight? 9. Can I take Keto Premium if I'm on other medications or pregnant? Keto Premium uses only the highest quality natural Beta-Hydroxybutyrate (BHB) exogenous ketone salts and MCT oil. We recommend that you consult with your primary care physician if you have any concerns. You should not take this if you are on medication for diabetes. 10. Where can I buy Keto Premium? Keto Premium is only available online. You can order Keto Premium from our order page by clicking here. 11. When will Keto Premium be shipped out? All orders of Keto Premium are shipped out within 24 hours unless it is a postal holiday or the weekend (after 10:00 am on Friday). 12. Is it safe to order Keto Premium online? Yes! We always ship in discreet, plain packaging – nobody will know the contents. * Results contained within may not be an implication of future results. Always consult your physician before making any dietary or lifestyle changes. Keto Premium was designed to boost ketosis to enhance fat burning, weight loss with the best quality all-natural ingredients available. We are providing a 90 day 100% money back promise, so you can feel confident that Keto Premium will work for you. To help you optimize your weight loss, we have several different savings packages available, depending on your needs. We recommend trying Keto Premium for 6 months. The savings in the long run will be well worth it.